Research has shown that effective school leadership can improve student learning. But while strides have been made to more closely associate effective leader behaviors with school, teacher, and student performance, the specific effects of leader performance on these outcomes remains less clear. 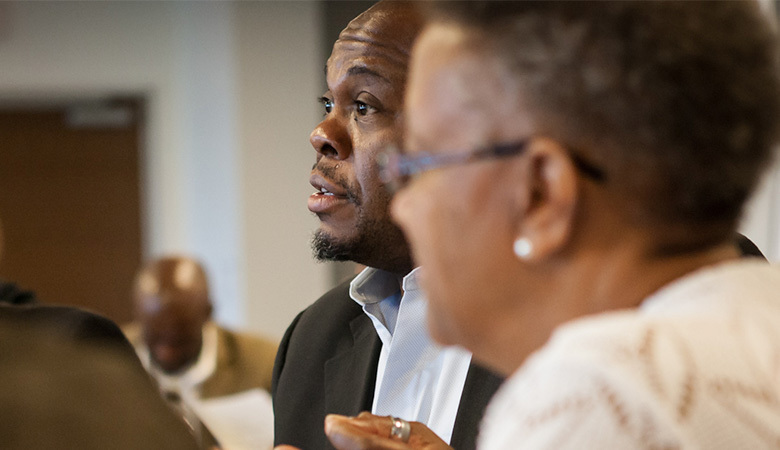 Over the past decade, EDC has contributed to this growing body of knowledge about what makes for effective principal leadership and training with funding from The Wallace Foundation. Through the Quality Measures™ Center for Program Assessment and Technical Assistance, EDC is supporting efforts to improve partnerships between principal preparation programs, school districts, and state educational agencies—a key step in preparing effective school leaders and improving student performance in chronically low-performing schools across the country. To learn more, read "Wallace Announces Seven Universities to Participate in 47 Million Dollar Initiative." The 2018 RAND report, Launching a Redesign of University Principal Preparation Programs: Partners Collaborate for Change, highlights Quality Measures’ role in supporting program assessment and partnership building efforts of seven universities funded by The Wallace Foundation’s $49 million University Principal Preparation Initiative. The second cohort of Quality Measures facilitators completed their training and are now certified to facilitate principal preparation program self-studies. This brings the total number of trained facilitators to 15. Nine of the 15 trained were hired this summer by EDC to support UPPI programs undergoing the second cycle of QM principal preparation program self-studies in fall 2018. Quality Measures: National Training Provider-Principal Graduate Professional Learning Community concluded its collaboration initiative in April 2017. The impact of this experience is captured in testimonials from participants from approximately 35 prep programs in EDC’s video case study, The Power of the Professional Learning Community: Evidence of Impact on Six School Districts and Their Principal Preparation Providers. Quality Measures: Principal Preparation Program Self-Assessment Toolkit, since release of the 2014 version, has registered a total number of 8,203 downloads (as an open source tool). The 10th edition toolkit, released in summer 2017, is now available. Quality Measures: Partnership Effectiveness Continuum, since its release in 2015, has registered 10,624 downloads from the Wallace website (as an open source tool). With the addition of new funding, the total number of EDC-facilitated QM self-assessments has expanded to 63 programs in states across the country including Colorado, Florida, Georgia, Maryland, New York, North Carolina, Connecticut, Virginia, Kentucky, California. This informational brochure describes the Quality Measures process, tools, and protocols designed to guide and support the collaborative self-study of principal preparation programs by states, school districts, and their training providers. This 10th edition toolkit was developed for use in states and districts taking part in Wallace Foundation-funded efforts to improve school leadership. It includes rubrics on candidate admissions, course content, pedagogy-andragogy, clinical practice, performance assessment, and graduate performance outcomes, and was designed to help principal preparation programs assess the quality of the training offered. This tool supports partnerships between school districts and principal training program providers in areas such as the quality of their communications and collaboration. It is meant to guide district and training provider discussions and planning so districts and programs can work together constructively.